If you’re facing similar struggles with your kids or just want to make snack time a little easier, you’re in the right place. I’ve spent a lot of time collecting and testing easy and quick healthy snacks for kids. Now I’d like to share my tried and true finds with you. 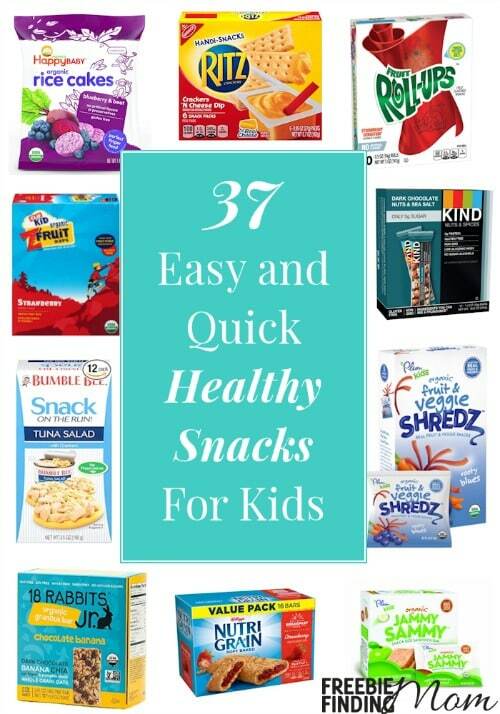 These 37 easy and quick healthy snacks for kids are sure to be a hit in your home. Trying to focus more on clean eating? If so, organic items can make for great quick healthy snacks for kids. You may be skeptical that these can replace processed snacks as your kids go-to goodie but give them a try. 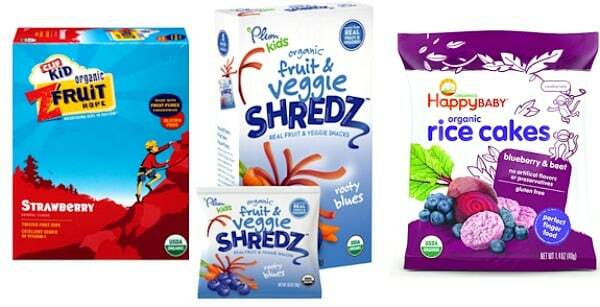 Here are my favorite organic quick healthy snacks for kids. Bonus: Most of these are really affordable. Organic doesn’t have to break the bank! 1. CLIF KID ZFRUIT – Organic Fruit Rope – With 4.9 out of 5 stars on Amazon, you know that this quick healthy snack for kids is going to be pretty darn good! Available in strawberry, grape, and a variety pack that includes strawberry, fruit punch, mixed berry and grape. 2. Plum Kids Organic Fruit and Veggie Shredz – I love this quick healthy snack for kids because with 97% real fruit you get a full serving of fruit with each individual pack. Plus, there’s no high fructose corn syrup, trans fats, artificial flavors, or preservatives. 3. Plum Kids Organic Jammy Sammy, Apple Cinnamon and Oatmeal – Need a quick healthy snack for kids that you can take on the go? Look no further. These sandwich bars are perfect to grab on the run. 4. Organic rice cakes for kids – When you think of rice cakes do you cringe? Do you think of tasteless, cardboard discs? If so, you’ve got it all wrong. There are a lot of delicious rice cakes out there including Lundberg Organic Rice Cakes, Brown Rice and they make great quick healthy snacks for kids. 5. Nature’s Path Organic Frosted Toaster Pastries, Wild Berry Acai – This quick healthy snack for kids is a great alternative to traditional “Pop Tarts”. While they still have a little more sugar than I’d like my little one to be eating first thing in the morning, they’re a good afternoon snack. 6. Honey Stinger Organic Honey Waffle – This quick healthy snack for kids is a great alternative to candy. The honey makes it sweet so you won’t even miss all that high fructose corn syrup. The next time your little one (or you) is craving something sweet reach for one of these. 7. Organic granola bars, Clif Kid Organic ZBar Chocolate Chip, or Clif Kid Zbar Organic Energy Bar Chocolate Chip – Cliff bars for kids were specifically designed to meet school nutirition guidelines and fuel kids while they play. These quick healthy snacks for kids are a great option for active little ones who need a snack on the go. 8. Organic juice drinks for kids – A tasty and nutritious drink like HONEST Kids Organic Juice Drink, Berry Berry Good Lemonade can be another quick healthy snack for kids. Warning: Watch the sugar on some juice drinks, especially in non-organic varieties. Giving your kids something with as much sugar as a soda kind of defeats the purpose (in my opinion). 9. Plum Kids Organic Fruit Mashups, Apple Sauce Strawberry Banana – We all want to feed our kids fruits and veggies, right? Unfortunately, that can often call for a lot of prep time which can be a real pain. Luckily, thanks to this quick healthy snack for kids, you can skip all of that. 4.9 out of 5 stars on Amazon! 10. Organic fruit snacks – Quick healthy snacks for kids like Annie’s Homegrown Organic Vegan Fruit Snacks Variety Pack are great because they’re made with real fruit juice and deliver the 100% daily value of Vitamin C. This variety pack comes in 4 great flavors including citrus (lemon, lime, orange), strawberry, tropical (mango, peach, tropical punch, and orange), and berry (strawberry, cherry, and raspberry). 11. Annie’s Baked Crackers, Cheddar Bunnies or Annie’s Homegrown Bunny Graham Friends (Honey, Chocolate & Chocolate Chip) – These quick healthy snacks for kids are great as a stand alone snack or to include in your little one’s lunchbox. Brothers-ALL-Natural Fruit Crisps’s available in Fuji Apple, Mixed Berry, Peach, Pineapple, Asian Pear, Banana, and Strawberry Banana. Welch’s Freeze Dried Fruit in Grapes and Mango. Natierra Nature’s All Foods Freeze-Dried Blueberries. Crispy Green 100% All Natural Freeze-Dried Fruits Variety Pack. Dried veggies like All Natural Crunch Dried Veggies Variety Pack. You don’t have to go organic to find quick healthy snacks for kids. Here are some of my favorite non-organic goodies. 13. Betty Crocker Fruit Snacks Gushers Snack Mega Pack – This quick healthy snack for kids is made with real fruit and is a great source of vitamin C.
14. Fruit Roll-ups Fruit Flavored Snacks, Strawberry Sensation – Low calorie, made with real fruit, and a good source of vitamin C… this quick healthy snack for kids has a lot going for it. The only con? Your little one is for sure going to play with his or her food. Don’t say I didn’t warn you! 15. Granola bars for kids – Specifically Quaker Chewy Granola Bars, make for a great quick healthy snack for kids. These bars have no high fructose corn syrup, are low calorie, and low in sugar (compared to many other snack options). 16. Mott’s Natural Applesauce – When reaching for this quick healthy snack for kids go for options that have no added sugar or sweeteners. 17. Fig Newtons Fruit Chewy Cookies – This quick healthy snack for kids is a great substitute for cookies. They’re delicious, sweet, and chewy yet made with whole grains and real fruit. 19. Snyder’s of Hanover Pretzel Variety Pack – Craving a little crunch? Reach for this quick healthy snack for kids. This is a great option when you want a low sugar snack for your little one. 21. Keebler Sandwich Crackers Variety Pack – Made with real cheese and peanut butter spreads and low in sugar, this is a good quick healthy snack for kids when you don’t want your little one bouncing off the walls. 22. David Sunflower Seeds, Original, Roasted & Salted – This quick healthy snack for kids is a good source of protein and even provides 2 grams of fiber. However, be warned, you’re going to find spit out sunflower seeds everywhere if you serve this up. 23. Sun Maid California Raisins 6 Pack – 100% fruit with no sugar added. Need I say more about this quick healthy snack for kids? I think not! 24. Sun Maid Vanilla Yogurt Raisins, 6-Count – Tired of “traditional” raisins? Here’s a fun twist on the quick healthy snack for kids. 25. Frito-Lay Baked and Popped Mix Variety Pack – Reaching for quick healthy snacks for kids doesn’t mean your little one has to give up everything he or she enjoys… it just means looking for healthier varieties or options. These baked chips are a big step towards making traditional potato chips healthier. 26. Kellogg’s Nutri-Grain Bars (Strawberry) – Since each tasty bar contains 3 grams of fiber and 9 essential vitamins and minerals, you can feel confident that this really is a quick healthy snack for kids. 27. Sensible Portions Garden Veggie Snack Straws Shape Chips Variety Pack – This quick healthy snack for kids is the perfect stand-in for traditional potato chips. In fact, according to the manufacturer, it has 30% less fat than the leading potato chip. 28. Handi-Snacks Ritz Crackers, Crackers ‘N Cheese Dip – Plain old cheese and crackers get a makeover in this quick healthy snack for kids. Your little one will get a kick out of using the little stick of plastic to spread cheese on crackers. 29. Old Wisconsin Snack Sticks, Turkey – Trying to cut down on gluten or go gluten-free? Then this is the perfect quick healthy snack for kids (and adults) in your household. 30. Pepperidge Farm Goldfish Crackers, Sweet & Savory Variety Pack These aren’t your mother’s Goldfish! What I’m trying to say is Goldfish have gotten quite the makeover in the last few years. You can now get baked Goldfish in a whole bunch of varieties. Just check out this quick healthy snack for kids. 31. Stacy’s Pita Chips and Wild Garden Humus & MultiGrain Pita Chips – Tip: If you want to make this quick healthy snack for kids even healthier, consider serving up fresh cut veggies to dip in the hummus as well as or in place of the pita chips. 32. TERRA Original, Sea Salt – Here’s another gluten-free quick healthy snack for kids. Hit up Pinterest for more gluten-free ideas. 33. Dark Chocolate Nuts & Sea Salt KIND bar – If you’ve never tried a KIND bar, you don’t know what you’re missing. They’re pretty awesome, and they come in a variety of flavors including sweet and savory. While these aren’t specifically a quick healthy snack for kids, you can safely let your kids enjoy KIND bars. 34. Bumble Bee Snack on the Run Tuna Salad with Crackers Kit – Need an afternoon pick-me-up? Look no further than this quick healthy snack for kids and adults. The tuna gives you a dose of protein that’s sure to help you power through until dinnertime. 35. Dippers Creamy Peanut Butter with Pretzels – Enjoy peanut butter crackers on the go with this portable quick healthy snack for kids. 36. Sun Chips Multigrain Variety Mix – These multi-grain chips make a good substitue for traditional chips. They’re still really tasty so your little one probably won’t even realize anything is amiss. This quick healthy snack for kids is also great to include in their lunchbox. 37. Signature Trail Mix Snacks – This quick healthy snack for kids can be a little high in sugar so make sure your little one goes for this snack when he or she has an activity to burn off excess energy. Coconut oil popcorn – This quick healthy snack for kids is perfect for movie night! 25 healthy homemade snack ideas – Homemade snacks may take longer than the options in this quick healthy snacks for kids article but many of them are worth the extra effort. Sweet potato and kale veggie chips – Sometimes those healthy veggie chips can be a little pricy. Save money by making your own quick healthy snacks for kids! For more awesome snack ideas like the quick healthy snacks for kids in this article, follow Freebie Finding Mom’s Toddler Meals & Snacks and Homemade Snacks Pinterest boards.